Massachusetts has a medical marijuana program which requires patients to qualify and obtain a card. It also has a licensed dispensary program where patients can access marijuana. Massachusetts dispensaries have been going through the application process and the state's health department says they could open as early as Winter 2015. 01. What medical conditions will qualify a patient for medical marijuana? Qualifying conditions in Massachusetts include: cancer, glaucoma, HIV/AIDS, hepatitis C, ALS, Crohn's disease, Parkinson's disease, multiple sclerosis, and other debilitating conditions as determined by the qualifying patient's certifying physician. 02. What documentation do I need from the recommending physician to provide with my application? A written certification from is required from the certifying physician. Forms or a process outline will be available after July 1st 2014. 03. Who can write a medical marijuana certification for a patient? A Massachusetts licensed Medical Doctor or Doctor of Osteopathy can write a marijuana certification for patients where a bona-fide physician/patient relationship has been established. Physicians must also be registered with the registry and have additional requirements to meet. 04. How much will it cost to apply for a registry identification card? The cost for patient registration is $50. 05. Can minors register in the program? Yes, but patients under the age of 18 must have two physician certifications and one of the physicians must be a board certified pediatrician or pediatric sub-specialist. 06. What is the possession limit? The possession limit is a 60 day supply which is considered 10 ounces of useable marijuana. However, only 2.5 ounces can be dispensed to a patient in a given 15 day time period. 07. Is registration optional or mandatory? Registration is mandatory in Massachusetts to benefit from the protections of the law. 08. Does the state honor other states' registries? Massachusetts currently has no reciprocity agreements with other states. 09. Can I choose any dispensary or do I have to designate a specific one? Massachusetts has a dispensary program and does not outline any limitations to designating a dispensary of choice. 10. Can a physician revoke a patient's written certification? There is no revocation process outlined, but cards are required to be renewed annually and patients are obligated to update the registry if they no longer meet the registry qualifications. 11. How do I renew my card? Qualified patients must renew their cards annual and be re-certified by a physician. There is a $10 fee for replacement cards. 13. How does the state law work with federal laws? It is important to recognize that these state marijuana laws do not change the fact that using marijuana continues to be an offense under Federal law. 14. How can I become a designated caregiver? Patients can designated up to two caregivers. Caregivers must be at least 21 years old and apply with the registry as well. 15. If I am a designated caregiver, can I grow marijuana? A caregiver can cultivate marijuana if a patient has been granted a hardship cultivation registration. 16. Can I be both a qualifying patient and a designated caregiver? There are no restrictions for caregivers from being able to also register as a qualifying patient outlined, please contact the registry for more information. 17. How do dispensaries, collectives and cooperatives work? Massachusetts offers a dispensary program. Dispensaries must be registered corporations that are operated on a non-profit basis. 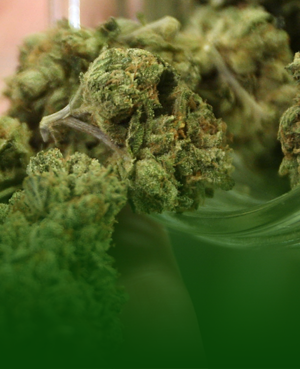 Dispensaries are granted rights to cultivate and provide marijuana infused products. Patients can choose to visit any dispensary and dispensaries are limited to provide no more than 2.5 ounces in a 15 day period. Several rules and regulations apply to dispensary operations. 18. How many dispensaries, collectives and cooperatives are allowed? A limit is not outlined. 19. Who can cultivate marijuana? Only registered dispensaries and patients or their caregivers who have been granted a hardship cultivation license can cultivate marijuana. 20. What rules apply to cultivation facilities? Cultivation must occur at the designated single location in an enclosed and locked facility. Several rules and regulations apply to dispensary cultivation from handling to inventory and testing.